The Patient Protection and Affordable Care Act sees very few provisions which allow federal bureaucrats to increase taxes on states. “Medicaid mandates” (or Obamacare rules) failed to attract attention as the mandate forcing people to buy health insurance approved by the government. Now, they both are reviewed by the U.S. Supreme Court. 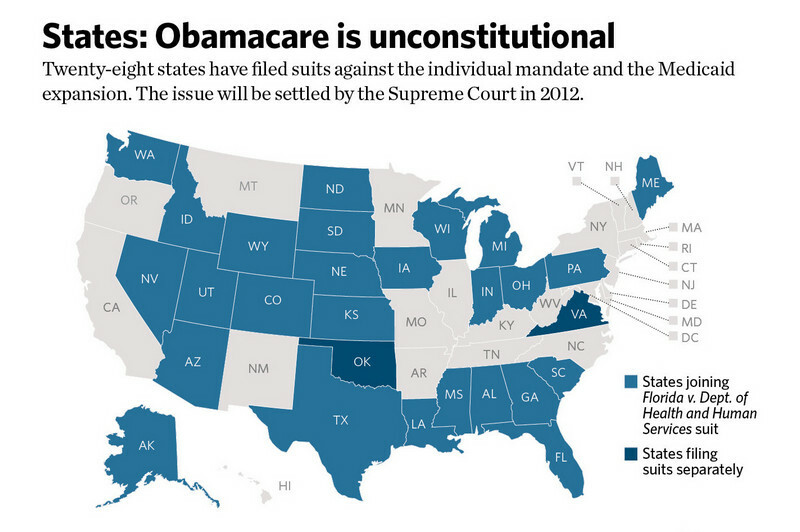 Few people know that the Medicaid mandates are constitutionally dubious, even worse than the individual mandate. Therefore, the Independence Institute of Colorado has taken the uncommon step of asking the court to overturn them. The constitution divides the power between the government and the states, as well as power among the three branches of the government. The reasons for this division are to improve decision-making of the government and to protect liberty. Both the states should be able to make independent decisions within their spheres for divided sovereignty to work. The federal government should not suffer from state coercion, and the states should not suffer from federal coercion. The founders of the constitution told this, and the courts have reaffirmed it many times. Obamacare intention of cracking the U.S. constitution by empowering the Department of Health and Human Services to bankrupt any state that makes any Medicaid decisions that differ from those approved by Obamacare. There are two points. First of all, Obamacare tries to impose new requirements on states for Medicaid expenses, refusing any choice to the contrary. These requirements are very expensive. The government promised to take up some of the tab, but the terrifying federal financial situation does not allow to say us for sure how and when this will happen. Here we come to the second part of the Medicaid mandates. If a state does not correspond to federal instructions, Obamacare authorize HHS to stop Medicaid funds to that state to the period which is up to the federal bureaucrats. They may stop just a portion of the funds or all of them. The state may lose all funding. Medicaid is a big state-federal program. That’s why HHS punishment would cause financial havoc in the state. The citizens would see millions they pay in federal taxes redirected to other states. Later, their state officials would have to fund substitute health programs for people with low outcome. In a string of recent cases, the Supreme Court of the USA has found this federal bullying unconstitutional. Again and again, the court has dropped congressional efforts to commandeer state executives, legislatures and courts. The court has allowed that the federal government to establish some terms on its grants to state governments. But those conditions should be minor that they are not “violent.” For example, the court has admitted that the Congress may keep 5 % of federal roadway aid to a state where people can drink being under the age of 21. But Congress gas no power to force states into bankruptcy. Quite the opposite. The Independence Institute’s abstract is one of the few filed on the Medicaid issue. So, the Supreme Court can see the constitutional principles involved and how the earlier cases have used those principles. My Canadian Pharmacy hopes that the Supreme Court follows its precedents and makes the Medicaid mandates a history.